Riviera Nayarit Mexico Blog: Dive Direct into Riviera Nayarit! 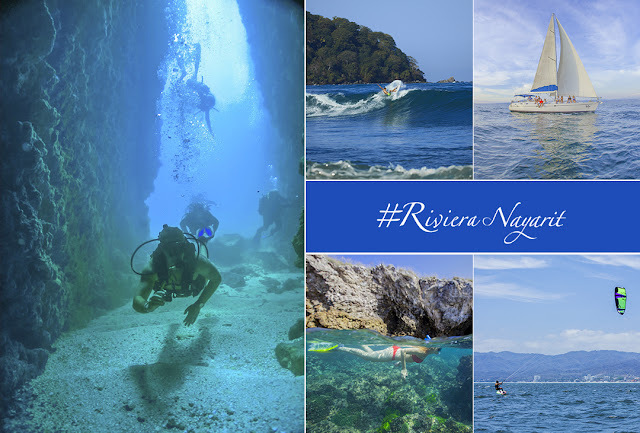 Dive Direct into Riviera Nayarit! Riviera Nayarit, in the state of Nayarit, spans over 200 miles of Mexico’s Pacific Coast. Home to some of Mexico’s most famous beaches, these are thriving regions with no shortage of fun water activities for all to take part in. See the top water sports you won’t want to miss in the Riviera Nayarit! Diving: Diving in the Riviera Nayarit is one of the top attractions for travelers looking for more than fun in the sun during their vacations. If anyone has ever dreamed of diving with whales, dolphins, or turtles, this is your chance! Surfing: Surfing lessons around the region are readily available at very reasonable prices for beginners, making this a great family treat. Off Riviera Nayarit’s coast, the Marietas Islands are a National Park and UNESCO World Heritage Site offering many opportunities for exploration and adventure. It’s here you’ll find the ‘Hidden Beach’ – a secluded paradise of white sand and crystal-clear turquoise waters, reached only by swimming or kayaking. Kitesurfing: It’s not easy, because it’s considered an extreme sport. However, if you’re a beginner and you want to check out kitesurfing, then Bucerías is the perfect place for you to start. It has the best breezes in the Pacific to practice this discipline, as well as top-level instructors.